Cinnamon Swizzle, commonly referred to as cinnamon infused simple syrup, can be added to numerous cocktails to create complexity or enhance and compliment the flavor in the drink. Try using cinnamon infused simple syrup where plain simple syrup is called for in cocktails with flavors that might compliment cinnamon such as apple, pear or cranberry flavored cocktails. Cinnamon infused simple sy... more. Voodoo Tiki Reposado Cream Pie Ingredients: • 1 graham cracker pie shell • 1 (14 oz.) can condensed milk • 3 oz. 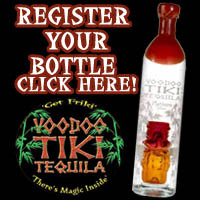 Voodoo Tiki Reposado Tequila • 4 oz. fresh lime juice • 1 1/2 cups heavy cream, stiffly beaten Preparation: Stir condensed milk with Tequila and Triple Sec. Add lime juice. Fold into whipped cream. Pour into pie shell and freeze 4 to... more. 1,000 Lemons, The Gourmet Tequila Lemon Drop Ingredients - 1.5 oz Voodoo Tiki Platinum Tequila - 1 oz Lemon Liqueur (See Recipe Below) - 1 oz Lemon Juice - .5 oz Agave Nectar - lemon zest - Lemon Peel Garnish Directions Stir all the ingredients over ice. Rim a Martini glass with sugar. Strain into chilled coupe glass, straight up. Squeeze lemon zest over ... more. Falernum (pronounced fah-learn-um) is a sweet, complex flavored syrup used in Tiki Cocktails. It contains flavors of ginger, clove, and lime, and sometimes almond, vanilla or allspice. It is used in cocktails in a manner similar to orgeat syrup or drunk on the rocks. The syrup form is primarily alcoholic, but nonalcoholic versions do exist. The consistency is thick, with the color most commonly li... more. Coconut Tequila Mojito 2 oz Voodoo Tiki Platinum Coconut Infused Tequila 2 chunks of Pineapple Fresh mint 1 oz Lime Juice .5 oz coconut simple syrup Muddle the pineapple and mint in a highball glass. 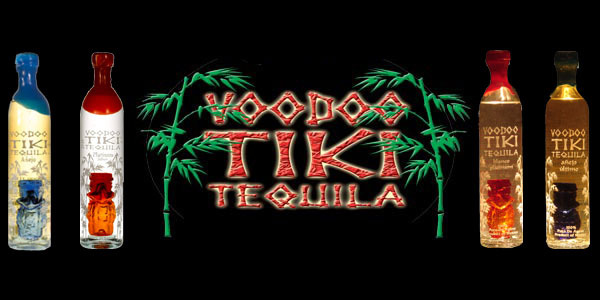 Combine Voodoo Tiki Platinum Coconut Infused Tequila, lime juice and coconut simple syrup in a mixing glass with ice. Shake well to break the ice. Ice the highball glass. Str... more. Although a complete history of Tiki cocktails could be a phone book size tome, the majority of Tiki cocktails were created and rose to prominence in the late 1920s through the early 1970s as part of the Tiki culture boom that spread across the USA. US servicemen returning from the South Pacific during World War II brought with them a taste for drinks made with exotic fruit juices and syrups. It'... more. Decadent Dark Chocolate Tequila Ice Cream Sounds incredible, tastes even better. Serve it in mini cones purchasable in your local supermarket, or you can make the cones with a waffle cone maker. For a double chocolate masterpiece, use the chocolate tequila ice cream as a side car on a dark chocolate tequila shot. Ice Cream Ingredients: • 3 cups of milk • 3 cups of cre... more. Voodoo Tiki Tequila Pork Tenderloin Ready for something exciting for your guests at the next Su Casa tequila tasting event? Try this recipe for Tequila Pork Tenderloin. It's an exciting dish for your tequila loving friends that is versatile enough to use for a dinner party, a buffet style carving station or even served cubed with tooth picks as pass arounds. Don't forget to have plenty of... more. For tequila sellers, Cinco de Mayo is like Valentine's for rose growers -- a top day for sales. And with tequila red hot, with more new tequila fans made daily restaurateurs are excited about the future of tequila and the many exciting craft brands available on the market. 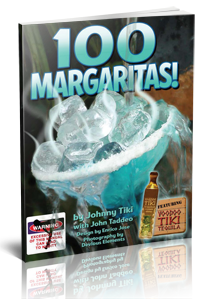 Numerous Tequila Bars expect to sell at least twice as much tequila on Cinco de Mayo versus what’s sold on a usual Saturd... more. Recently a bottle of tequila sold for 3.5 million dollars, which for a bottle of tequila far surpasses the price range of all the rest. But what did the purchaser actually get? Was it a "Jewelry Purchase" disguised as a tequila sale, or was it the quality of the tequila truly unique? There are many beautiful packages in the liquor industry, but it's always nice when the contents hold up to t... more.